After examining the evidence, it should be obvious that the Earl of Oxford was crucial to thecreation of the first successful yearround commercial public theaters in London. Was he also responsible for their design? The Theatre built in 1576 in the London suburb of Norton Folgate by James Burbage and his head carpenter Peter Street (who later would also build theaters for Burbage’s rival, Philip Henslowe) had a unique shape as can clearly be seen on several birdseye maps of the period. These theaters are not only round, they are at least three or four stories tall, and topped as well by roofed additions of some sort that seem to add another story. On these maps they stick out like sore thumbs. Where did this unusual design originate? In her book Theatre of the World (1969), Shakespeare scholar Frances Yates connects this unique shape with plans for theaters created in ancient Rome by the classical architect Vitruvius in the first century B.C. 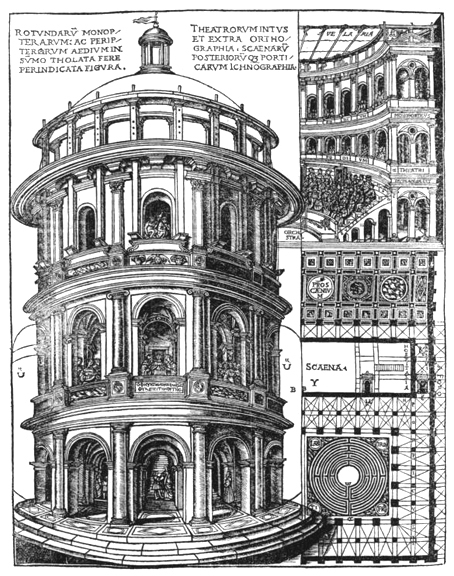 Yates, who writes about both Shakespeare and John Dee, and about the literature of the occult, noticed that the round shape of these theaters conformed to these designs by Vitruvius, available at the time only in his book, de Architectura, one of thousands of arcane titles in Dee’s library. Vitruvius V,7: design scheme of a theater ground plan. The shape of these theaters, six-sided on the outside and more or less round on the inside, suggest an attempt on Burbage’s part to approach the acoustical ideal as described by Vitruvius. In a theater like Burbage’s, every seat in the house was almost equidistant from the stage. 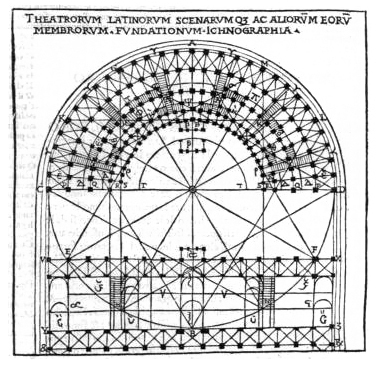 Thus––as noted by Vitruvius, who was perfectly aware of the physics of sound––rising and expanding sound waves produced by musical instruments and the voices of actors and singers, contained and amplified by the particular shape of the surrounding structure, could be heard equally clearly and distinctly in all sections of the auditorium. In addition, Burbage’s Theatre was made of wood, which, as Vitruvius notes, vibrates with sound and resonates so that the resulting structure functions like a very large musical instrument. Thus, in the middle of the afternoon, on a bare stage with only the most necessary props, Shakespeare’s theater was far more an aural than a visual experience. Unlike a pageant or a masque in which the impact came chiefly from the costumes, staging, music and props––it was supremely important for the early commercial London Stage that the words could be heard by everyone in the theater, and what words! This theatre initiated the theater-building movement of the English Renaissance and was the direct ancestor of Shakespeare’s theater, the immortal Globe. I believe that out of Dee’s popular Vitruvianism there was evolved a popular adaptation of the ancient theater, as described by Vitruvius, Alberti, and Barbaro, resulting in a new type of building of immense signifcance for it was to house the Shakespearean drama.” (41). Since it’s unlikely that Burbage could read Latin or French, and since there would be no English translation, none published anyway, until the late 18th century, for Burbage to have benefited by Dee’s knowledge of Vitruvius he would have to have known the great John Dee personally. To connect the carpenter with the magician, Yates feels it necessary to attribute to Burbage scholarly traits that don’t match with what we actually know about the rough and ready actor/entrepreneur whose nature, based on his behavior, matches better with that of the American gangster Bugsy Seigal, whose place in history as the first man to build a gambling casino in the Nevada desert fits with Burbage’s story far better than it does Yates’s fantasy. Knowing nothing of Oxford, his tutor’s library, or his interest in music and musical instruments, Yates was forced to turn to what she did know, namely John Dee and his library. She didn’t know that Burbage’s innovative new Theatre was begun within weeks of Oxford’s return from a year in Italy, that it was built on land recently controlled by his boyhood companion, the Earl of Rutland, that Oxford would soon be living in Shoreditch himself and would be holding the lease to the other new commercial stage built that same year, the children’s theater at Blackfriars. Woodcut illustration of an ancient Roman round theater. Oxford had his year in Italy just when Italian interest in theater art was at fever pitch. Not only was the improvizational street theater, the Comedia dell’arte, sweeping the towns and cities of Northern Italy and France, but experiments continued, in particular in Florence with a coterie of humanists and artists known as theCamerata (f.1573-1582) that within a few years would result in the beginnings of Italian opera. Five years after Oxford’s visit, the great Italian architect of the period, Andrea Palladio, began building the Teatro Olimpico, a huge indoor theater made of stone and marble based on Vitruvian designs, still to be seen in the center of Vicenza, Palladio’s home town. Before beginning the Olimpico, Palladio had experimented with temporary outdoor wooden stages, no longer standing, but one or more may have been in operation when Oxford was travelling around through the towns of Northern Italy. In any case he would certainly have heard about them. Thus the simplest and most direct line for the development of the Elizabethan public stage begins with Oxford’s year in Italy, where he could have observed or heard about the temporary open air wooden stages built by Palladio on the same Vitruvian principles he would follow in building the Olimpico, to whose book, in Latin, French, and Italian, Oxford had access by way of his tutor’s library. That he and his patrons and the carpenter-actor James Burbage planned to create such a theater as soon as Oxford returned from Italy is well within possibility. That he was privy to the efforts of Palladio to create the sort of theater that Burbage would in fact create in London, seems equally likely. As a Production Designer I recently designed and constructed an Elizabethan stage, much in style if the Globe Theatre, for a motion picture in the Casa Blanca Studios in Hot Springs, California. The most interesting result was an amzing acoustic ability for the actors to be heard so clearly while recording our scenes. Since everything was constructed out of wood, the sound was greatly enhanced by the typical “heavens” ceiling that was almost the size of the stage overhead, partially held in place by the two columns of Hercules. It was a most rewarding experience to reconnect with that theatrical period in our history of entertainment and to better understand Burbage’s approach to design. Thanks for this, Jack! Very interesting. If you haven’t done so already, I suggest researching Vitruvius online. It’s just not possible that Burbage came up with this idea without some help from an outside source. The Frances Yates book would also be of interest. I read the Palladio link with great interest, it seems he was basing his architecture on ancient Roman structures, and they had a design for a theater that worked, it just doesn’t look like the theaters in London, but I may have missed the specific entry for that design you mention, can you direct me to the right page?? Very interested. Karin, the links will take you to the support for this essay, all but the book Theater of the World by Frances Yates, who was the first, possibly the only, Shakespeare commentator to see a connection between Vitruvius and Burbage’s Theatre (even its name, “The Theatre” is, according to the OED (1971) the first use of the word theater in English for an enclosed single-purpose building. Yates attempted to connect Burbage with Vitruvius through John Dee, but the connection is much more direct and more likely through Oxford and Smith, Oxford having had access to Palladio’s theaters a few months before Burbage’s was built. Yates’s work has been ignored by the academy, which continues to claim a connection to the various stages and theaters that existed in England at the time, missing the point that the Vitruvian theater made of wood amplifies sound, something the arenas don’t, sound not being a factor in watching animals kill each other or men put on fencing exhibitions. The theater in Venice had burned down before Oxford came to Italy (and no other theaters are listed), I do not seem to be able to find any drawings for it (lost perhaps) but his later theaters were all according to the ancient Roman theater principle as were all his designs. The theaters of Palladio (Vicenze) and of ancient Rome had one thing in common, the elevation of the stands as crucial to the accoustics, this principle is totally missing in the wooden theaters. for example of the teatro Olimpico (http://upload.wikimedia.org/wikipedia/commons/3/39/1968Italia1081.jpg) and compare the crucial accoustic part of the stands of the Globe Theater… it doesn’t add up. Now the upright of the stands that is quite unique in theater building to this day. I am sorry to press this point but I have been in many ancient Roman theaters and they are so different from the Globe that it seems that the trivial detail of they are both round on one side seems so overstated as proof. BTW how much time was there between Oxford coming back from Italy and the start or finishing of the build of the theatre? Timewise it is also important, finding a partner to build with, designing and getting the building up takes some time. Karin, I’m glad to see that you’re interested in pursuing this and that you know a fair amount about the issue. You’ll note that the essay is presented as a question, meaning that I don’t imagine that I have the answer, just that I see a possible connection between what facts we have. What do you mean by “uprights of the stands”? Where can I get detailed information on the plan for the Globe? It’s a pity that we don’t have more than the word “round” to describe Burbage’s 1576 Theatre, the first round theater in England. I would imagine that had Burbage’s Theatre been built a particular shape for purposes of acoustics, the Globe (1599), also built by Peter Street, would have been built to the same plan, or one very similar. So if we have the actual design for the Globe, we can assume that Burbage’s was the almost the same, at least in the essentials. Please recall that those theaters in Italy that remain from the Renaissance are made of stone, in which the acoustics will be very different from in a theater made of wood and plaster. In his chapter on theaters, Vitruvius has a section on the use of large bronze jars as amplifiers in stone theaters. These are not needed in wooden theaters. The timing of the building of Burbage’s Theatre is one of the facts that suggests that Oxford was involved. Oxford put his feet on English soil on April 20, 1576. Burbage had signed a contract leasing the land on which he intended to build the theater on April 13. Within weeks the building was up and running. A few months later, in time for the winter season, the private theater at Blackfriars was created. Proof of Oxford’s involvement in that can be seen by his ownership of the lease, tossed like a hot potato from Henry Evans to Oxford to Lyly to Hunsdon in 1583. Academics treat the creation of the first two successful yearround commercial stages in England like separate events, but they connect at too many points to be a coincidence. 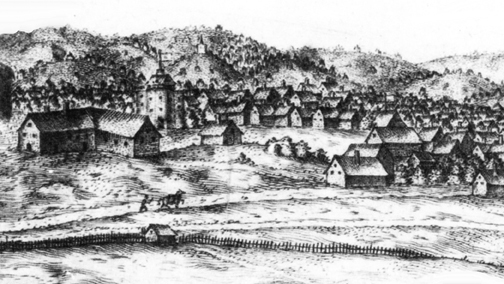 Since these two stages must surely have been built to circumvent the Privy Council’s order of December 1574 that there were to be no more plays shown in London inns, until then the venue for the increasing number of acting companies, the likelihood is that Oxford went to Italy with the need for London theaters already in mind. That Burbage made the deal shortly before Oxford landed suggests that someone with clout had arranged it ahead of time. With Privy Councilors Sussex and Hunsdon both interested in having such a stage, and with Oxford’s old friend Rutland still something of an overseer of the land on which Burbage built his in Norton Folgate, this seems like the most likely scenario. There are too many points in this argument to list them all here. Many are dealt with in other essays and blogs that can be located by typing a keyword into the search field. You start with a question but end with the conclusion that the Elizabethan theaters started with Oxford’s trip to Italy. The analysis is easily made..
A few weeks to plan and build a three story wooden structure?? I thought it took months at best. I still find the timing part odd, were the builders waiting for Oxford to return with plans? All the material ready and waiting…. So Oxford went to Italy because of the 1574 order… to find a way to build theaters…. The simple conclusion for me seems to be that the combination of the bear-baiting structures and the Red Lion, and the court-yard history of spectators on balconies is easy enough to put together. Did they know of how the accoustic works?? Maybe they did not need to know the sound does not have to travel very far, not as far as in the Roman theaters. As the theater designer, Jack McAdam, above notes from his personal experience, a round wooden stage amplifies sounds to an unusual degree. To make it possible to reach two or three thousand people at a time, amplification of sound would be a major concern. To think that the men who created the London Stage had no notion of acoustics is, I believe, what is known as “presentism,” the fallacy of thinking that people in the past knew less about those things on which their lives depended than we know today. Yates made the connection with Vitruvius, we make the connection to Oxford through Smith and Palladio. When you have some genuine research under your belt, I will be happy to continue the discussion.